Wrigley Field is a very special ballpark. It’s one of the last standing parks where stadiums were built to have their own personality and give their team a bit of a home field advantage. 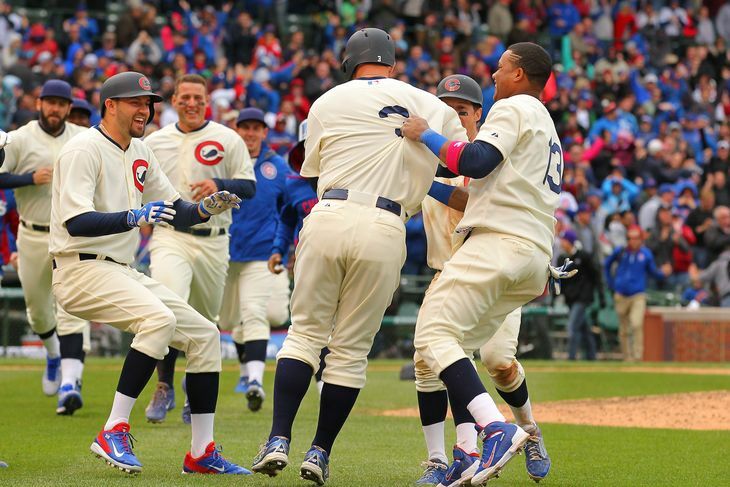 Since the Chicago Cubs are in the National League, the Kansas City Royals only visit Wrigley once every 6 years. This year, a number of Royals fans made the trek to the ‘Windy City’ to take in their Royals playing the Cubs and to visit their iconic ballpark. 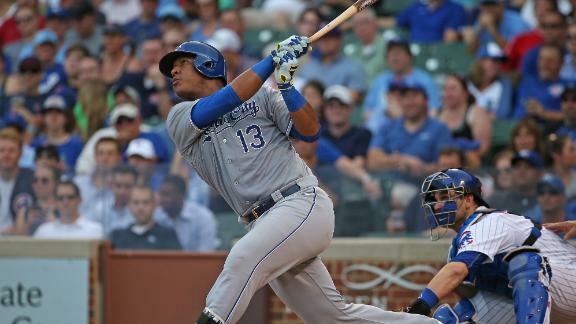 The Royals were also looking to bounce back from a rough series in New York and were looking to gain some ground in the American League Central. One of those items were kind of accomplished, one was not. Onto a look back at a special 2 game set. It normally goes without saying as well that Gordon contributed defensively, throwing out Dexter Fowler at home(thanks to a nice play from Salvador Perez) in the bottom of the 11th inning on Sunday. It appears as if Alex might be hitting a hot streak right now, and if that is so it’s not the worst idea in the world to move him up in the order. Alcides Escobar has been struggling a bit at the top of the order and Gordon has a history of performing well in the leadoff spot. With the Royals runs per game dipping in May, it might not be a horrible idea to shake things up. A large chunk of the success on this season hinders on the performance of young starters Danny Duffy and Yordano Ventura. Duffy currently is inhabiting the disabled list, while Ventura seems to have found his groove. 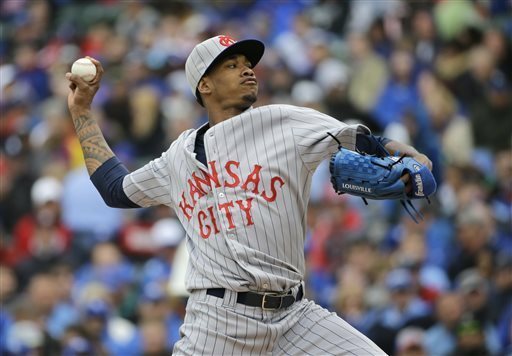 Ventura had his second best game score of the season on Sunday against Chicago, going 7 innings giving up 4 hits and 1 run while walking 1 and striking out 6. Ventura did all that in less than ideal weather conditions and if not for his lone walk in the 7th inning, one wonders if he would have left the game without giving up a run. One also wonders how Chris Coghlan was able to hit Ventura, since no one else on the Cubs had a clue. The best part of the game for Ventura is that he has gone 7 innings in 4 straight starts while keeping his walk total down. Starts like these make it easier to see why he is the ace of this staff and why baseball in general is so high on this young flamethrower. Walks can kill a pitcher. I mean, they are called ‘free passes’ for a reason. This was none more evident than on Sunday, as walks given up by Royals pitchers in both the 7th and 11th innings would come back and bite them in the arse. In the 7th, Ventura would walk Cubs catcher Miguel Montero, and following a wild pitch and single to center by Coghlan, the Cubs would spoil Ace’s shutout, tying the game up at 1. With the score still tied in the 11th inning, Royals reliever Ryan Madson would walk the only two batters he faced, Dexter Fowler and Kris Bryant, which would lead to his exit and Jason Frasor to come in. Frasor would intentionally walk Starlin Castro after Fowler would be thrown out at home plate, but then David Ross would get the game winning hit falling in between Gordon and Escobar in left field(which was almost caught over the shoulder by Escobar). The 2 walks by Madson killed the Royals and goes to show you just can’t allow the other team to have extra base runners on the base paths. The Royals are normally applauded for their defense and stingy bullpen. The pen loses that credit when the walks start flowing. It also goes to show why some of us(myself included) put such a heavy emphasis on having the offense take bases on balls. Rios has been out since the third series of the season in Minnesota. Rios was hitting well before getting hit on the hand, so hopefully he can return to that form on his return. Personally, I would prefer one less reliever on the roster and have the extra outfielder. In fact, Orlando has been much more valuable to manager Ned Yost this year than Jarrod Dyson has. I have a feeling we will see Orlando again soon, possibly even within the next month. Mother Nature won again on Saturday, as the contest between the 2 teams was rained out. I don’t know what it is, but it appears the last 3 times the Royals were scheduled for a nationally broadcasted game, they have been hit hard by the rain bug. 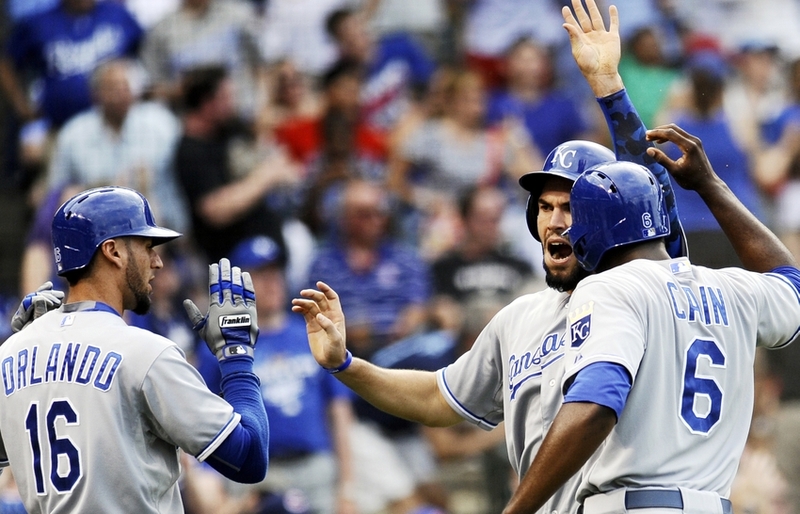 The Royals will travel back to Chicago and make up the missed game on September 28. Danny Duffy is currently playing catch leading into his first bullpen session since his cortisone shot. Nothing major to report, other than the stiffness in his shoulder was still there. I tend to think he will make a couple of rehab starts in Omaha before he returns to the main roster. Also, the beard is gone. A city mourns. I’ve said it a million times, but if Gordon walks after this season that will be a giant hole to fill within this team. I would love for the team to work out an extension sooner rather than later. Kris Medlen will depart Arizona for a minor-league assignment "sooner than later" Dayton Moore said today. Still needs to build up to 5 IP. The team won't determine a role for Medlen until they see how he responds to competition, and they see what big-league needs are. Basically, pretty much nothing has changed since KC signed Medlen. But team is encouraged with his progress and Moore said he's on schedule. #Royals have now decided to stretch Brandon Finnegan out as a starter. He will start tomorrow for Omaha and be on 60-pitch limit. Finnegan had been working in relief, but club officials noticed glitches in delivery, decided pitching as a SP was best way to fix him. Also, Sean Manaea tweaked his groin and stalled his throwing program. He will likely head for Double A by third week of June now. Just remember Cubs fans, those Royals fans sitting there at Wrigley probably hate the Cardinals as much as you do. This about this: Wade Davis hasn't allowed a home run to the last 446 batters he faced. Last HR: Aug. 24, 2013; Ian Desmond. #Cubs’ Arrieta serves up 3 HRs through 4 innings vs. #Royals after allowing 3 in previous 90 1-3 innings going back to 2014. Unfortunately, the loss on Sunday pushed the Royals back to 2nd place in the American League Central, half a game behind Minnesota. Yep, the Twins are in first. Baseball truly is a crazy sport and it goes to show that anything can happen, no matter how many different ways you crunch the numbers(and that is coming from a stat guy!). 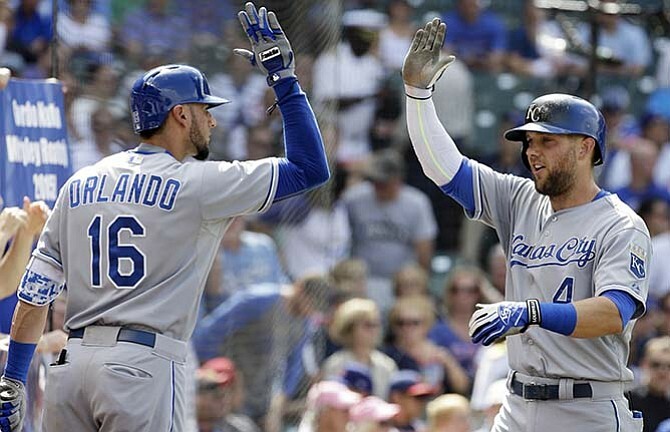 The Royals will take Monday off (Sal Rest) and will return to action against Cleveland in Kansas City. This home stretch with Cleveland and Texas coming into town is big and the Royals need to go at least 4-2 during this stretch. The offense seems to be slumping and one wonders if maybe a shuffle of the lineup would do the ballclub some good. Jeremy Guthrie goes for Kansas City on Tuesday(looking to avenge his awful start on Memorial Day) and the Royals will go up against Corey Kluber on Wednesday. I think we can officially say this team is in the midst of a slump, which is fine considering it’s really the first one they’ve had this year. Let’s just not make it a sustained slump, okay guys?